The Harrier is a breed of scenthound that was developed to hunt hare, although it has also been used to pursue fox. Their intermediate size makes them capable of working with hunters on foot as well as horseback. Although the ancestry of the Harrier is greatly debated it is generally agreed upon to be an ancient breed of scenthound. The oldest documented pack of Harriers is the Penistone pack, which existed in 1260 in southwest England. Some have suggested that it is an even older breed. The Greek historian Xenophon wrote of Greek hounds that sound much like today’s dog. It is possible that this hound may have been brought to Britain by the Romans. The most popular theory is that they are simply a bred down version of the English Foxhound, but this can be easily discredited, as the Foxhound only dates back to the 1400s and would not have existed at the time of the Penistone pack. Other suggestions include various crosses and combinations with Bloodhounds, Basset Hounds, Fox Terriers, Greyhounds, the extinct Talbot Hound and/or Beagles. 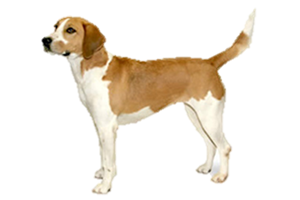 The most likely candidates are the Bloodhound, Beagle or Talbot, as they are the only breeds that are old enough to possibly predate the breed, it could be that the Harrier and Beagle simply came from the same root stock of the Greek hound mentioned above. Regardless of its ancestry, it is known that English Foxhound would be added in 1825 to increase their speed, but also to strengthen the bloodline as a serious decline in Harrier numbers had occurred. This decline was only increased by both World Wars, but the line now remains stable. Is the Harrier Right for You?